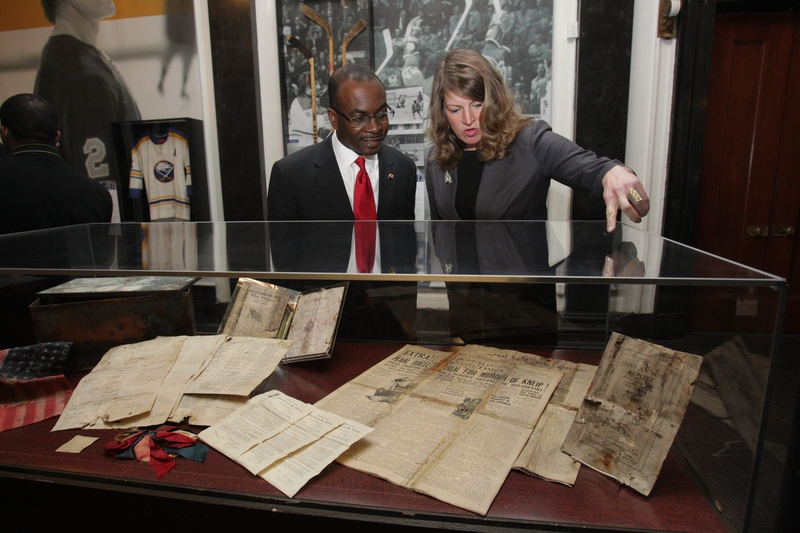 Buffalo History Museum Executive Director Melissa Brown shows Mayor Byron W. Brown the contents of a time capsule Friday that was found last week at the base of “The Hiker” statue at Main and Huron streets. See a photo gallery at BuffaloNews.com. Soviet Russia was marching on Poland, the Crystal Beach ferry was resuming service, and future President Herbert C. Hoover had just lost a presidential primary in California. Those were among the stories in old Buffalo newspapers – eight in all, dated May 29, 1920 – unearthed March 18 in a deteriorated copper box in downtown Buffalo. The contents of the time capsule, buried in the foundation of “The Hiker,” a Spanish-American War monument at Main and Huron streets, were revealed Friday at the Buffalo History Museum. The statue was recently moved for road construction that will return vehicular traffic to Main Street. Other artifacts – all in tattered condition, with five of the newspapers too wet to be displayed – included the first annual report of the city Planning Committee, a regional booklet titled “The Hiker” written for Spanish-American War veterans, a 48-star American flag and a list of names from the dedication ceremony that was found rolled like a scroll and wrapped in a red, white and blue ribbon. “The time capsule shows a glimpse into the past,” said Mayor Byron W. Brown, noting the city’s population then was more than 506,000 people. It was also a complete surprise. “This is really an exciting time, because we were not aware of this time capsule at all. Oftentimes, when time capsules are buried there are dates when they should be removed and opened for the public, and we did not have that documentation,” the mayor said. The Buffalo Arts Commission brought the time capsule first to the art conservation department at SUNY Buffalo State, which found its contents water-saturated and moldy, before they were taken to the Buffalo History Museum. “The time capsule is a way for people from the past being able to communicate to us, and others they never knew, to tell us what they were doing in their everyday lives,” said Catherine Gillespie, chairwoman of the Buffalo Arts Commission. “The Hiker” statue was created by New York City sculptor Allen G. Newman. The name “hiker” was the term infantrymen used to address one another casually in the 19th century, and the expression, “Hello, Hiker!” was a common greeting. The mayor said there are plans to re-encapsulate the deteriorated and moldy artifacts in digitized form into a new time capsule with items from 2014 when the statue is returned. “One of the things that I am going to put in are some coins from today, because oftentimes in time capsules there is some money that is put in. So I am going to put money in so if there is any deficit in the City of Buffalo when this is opened in 50 years, the new mayor will be able to enjoy those funds,” Brown said. Because of the presence of the Planning Committee report, the mayor said he may want to include the nearly complete Green Code, the first comprehensive revamping of the City Code in 51 years. The time capsule’s contents will be on display at the museum at least through April 18, Melissa Brown said.